If you are reading Space Safety Magazine, you probably know already the International Space Station, the human outpost in low Earth orbit where a crew of six astronauts lives, performing scientific research and advancing our understanding of the space environment. You know already that last year the ISS celebrated its 15th birthday in space. Since November 1998, the ISS has grown the size of a football field, with modules from US, Russia, Europe and Japan. What most people still do not know is the importance of the scientific research carried out aboard the space station. In the field of medical science, there are studies about the adaptability of human bodies to space, but also research offering applications to greatly improve quality of life both in space and down on Earth. Naturally, this article cannot encompass all the contributions to space medicine in the last 16 years, but we can dip into the ocean of research to better understand the benefits of having an outpost in space. The ISS is an exceptional environment for performing investigations that affect human health not only in space but also and especially on Earth. The microgravity environment and the necessity of supporting astronauts’ health allowed advances in many fields, increasing our understanding of the human body and mind. Space affects humans on a macroscopic level, but individual cells and the harmful microorganisms such as viruses and bacteria are also impacted. Some of the greatest discoveries of space medicine have derived from the simple lifeforms. Dr Nickerson of the Biodesign Institute at Arizona State University (Credits: Nick Meek). The U.S National Laboratory Pathfinder program, managed by the Center for the Advancement of Science in Space (CASIS), offers ISS as a research platform for commercial research and development to treat infectious diseases. Microgravity has been shown to increase the virulence of organisms, altering microbial growth rates, antibiotic resistance, microbial invasion of host tissue, and genetic changes within the microbe. Although it may seem an undesirable discovery, these strengthened microbes represent an opportunity to develop new and improved therapeutics, such as vaccines and drugs, intended to specifically eradicate the pathogen, once the components of the organism that facilitate increased virulence in space have been identified. Infectious disease research in space began in earnest in 1998, thanks to researchers Cheryl Nickerson, Ph.D., at Arizona State University and Timothy Hammond, Ph.D., at the Durham Veterans Affairs Medical Center who wanted to understand how Salmonella bacteria would respond to a microgravity environment. According to the Centers of Disease Control and Prevention, Salmonella is estimated to cause about 1.2 million illnesses in the US, 23,000 hospitalizations, and 450 deaths; Salmonella diarrhea remains one of the top three causes of infant mortality in developing countries. In order to better understand the mechanism behind the virulence of the pathogen, Nickerson and Hammond prepared several experiments that were carried out over the course of many Space Shuttle’s flights. Mission specialist John Phillips activates the MSRA experiment on the middeck of Space Shuttle Discovery during STS-119 on March 2011(Credits: NASA). Follow-on experiments have examined the virulence of other microbes, especially the methicillin-resistant Staphylococcus aureus, also known as MRSA, a type of bacteria resistant to antibiotics such as methicillin, penicillin, and amoxicillin. MRSA is especially troublesome in hospitals, where patients with weakened immune systems are at greater risk of infection. Thanks to the space-based Salmonella research, pharmaceutical corporation Astrogenetix developed a potential candidate vaccine that is now under review. In 2011, two Arizona State University teams led by Nickerson and Roy Curtiss III, Ph.D., sent vaccine samples against Streptococcus pneumonia on STS-135, an ISS assembly flight which delivered the Multi-Purpose Logistics Module Raffaello. The Streptococcus pneumonia is responsible for more than 10 million deaths annually, particularly among newborns and the elderly who are less responsive to traditional vaccines. The samples sent to the space station were a genetically altered strain of Salmonella that carries a protective antigen against the bacteria. The Arizona State University research teams are seeking to increase the effectiveness of vaccines like Recombinant Attenuated Salmonella Vaccine, or RASV, which is currently undergoing clinical trials. Molecular targets identified in space promise to improve existing anti-pneumococcal RASVs. Since RASVs can be produced against a wide variety of human pathogens, the outcome could influence the development of vaccines against many other diseases. Sometimes, the technology developed for space finds smart, scaled applications on Earth. This is the case of with neuroArm, a robotic surgical limb adapted directly from the experience of the Canadian Space Agency (ASC-CSA) in creating robots to build and maintain the ISS, providing heavy-lifting and berthing capabilities. NeuroArm, the world’s first robot capable of performing surgery inside magnetic resonance machines (MRI), is an application of the technologies derived from Canadarm, Canadarm2, and Dextre. The first case treated by neuroArm dates back to 2008; since then, the robotic surgeon has been used to successfully treat sixty more patients. The device was built by the MacDonald, Dettwiler and Associates Corporation (MDA), which developed the Canadarm for the Space Shuttle program, together with Dr. Garnette Sutherland at the University of Calgary. The goal was to create a highly precise robotic arm able to work in conjunction with MRIs to provide surgeons with advanced imaging capabilities while performing the operation. “The idea was if they could build complex robots, perhaps in collaboration with medicine, we could build a robot that could operate inside an MRI machine,” explained Sutherland on “Benefits for Humanity: In Their Own Words” video by NASA. neuroArm had to be made entirely from non-magnetic materials, to avoid interactions with the MRI’s magnetic field and to not affect the quality of the images. In fact, MRIs create a strong and uniform magnetic field of about 1.5T and interaction between this magnetic field and ferromagnetic objects is known to lead to heating or torque of these objects during MRI operation. Therefore, such materials are prohibited in proximity of the scanners, much less inside them. 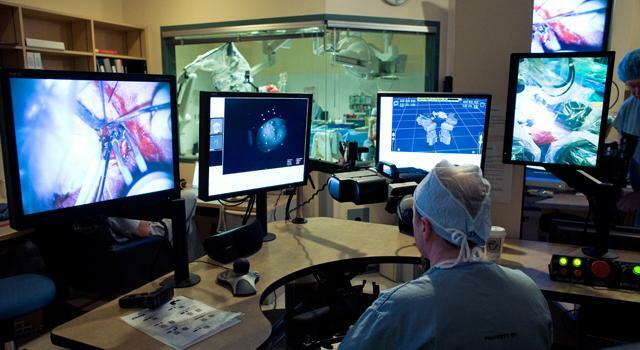 Moreover, since the robotic arm is teleoperated, the operator had to be provided with a feedback recreating the sense of touch, an essential capability in order to precisely control the robot while performing a brain-surgery. According to Sutherland, neuroArm operates at a level of precision “that is overwhelmingly superior to what the best surgeon may be able to do.” In particular, it can move in increments of 50 microns without tremor, while a human surgeon can move in increments of one or two millimeters. A second generation robotic system, neuroArm2, is now in development, with a requirements document nearly completed and preliminary design taking shape. Dr Sutherland during an operation while teleoperating neuroArm. The Alpha Magnetic Spectrometer-2 (AMS) on orbit (Credits: NASA). Sometimes medical applications come from space research that has nothing to do with space research for medicine. This is the case of the Alpha Magnetic Spectrometer-2 (AMS-02) and the prosthetic limb that helped German athlete Wojtek Czyz to set Paralympic a world record in long jump. AMS-02 is the largest experiment ever flown on ISS. Mounted outside the orbiting station on top of the Integrated Truss Structure since May 2011, it studies cosmic rays and searches for evidence of dark matter. Its development originated a light-weight, high-strength carbon-fiber material that was applied for prosthetic limbs. Below, a video about the Alpha Magnetic Spectrometer. 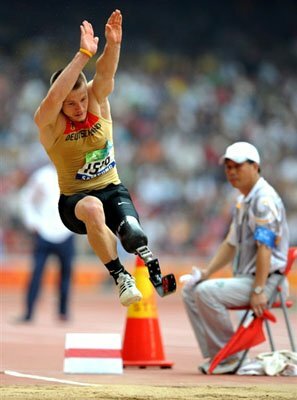 In 2008, Czyz, wearing a space-tech enhanced prosthetic leg, set a new long jump world record at the Paralympics in Beijing, reaching 6.50 m and exceeding the previous record by 27 cm. Czyz remains the current holder of the record, as well as other world records in sprint competitions for leg amputees. His prosthetic leg is the result of the collaboration with ESA’s Technology Transfer Programme (TTP) technology broker MST Aerospace. In 2004, Czyz, who lost part of his left leg because of a mistreated sports accident, met with MST Aerospace to perform a pre-screening of the most crucial elements of his prosthesis. Wojtek Czyz jumps before winning the final of the men’s long jump F42-44 classification event at the 2008 Beijing Paralympic Games in Beijing (Credits: AFP/Mark Ralston). “The objective was to see how to improve his performance, and we found the most important problem was related to a connection angle, the so-called L-bracket, between the knee joint and the foot module,” explained MST Aerospace Managing Director Dr Werner Dupont in an ESA feature. MST Aerospace collaborated with the German company ISATEC to develop a new L-bracket using carbon-fiber materials originating from AMS-02. The materials used are extremely strong and at the same time lighter than conventional products available. Before using these materials, Czyz’s previous prosthesis were subject to break up when he performed to the maximum of his capacity. MST and ISATEC kept on working on prosthesis and developed a model for sprint competitions, made with a single-part foot module in carbon fiber reinforced plastics. The case studies highlighted in this article are just a small fraction of the advances brought “down to Earth” from research connected to ISS. It underscores the irreplaceable contribution a space laboratory, orbiting at about 400 km above our heads, makes to humankind. Afterall, ISS has probably already silently improved – or even saved – your life. This is the sixth chapter in a series of articles dedicated to space medicine and astronauts. In the series, we are presenting and exploring topics involving medical emergency management in space, astronaut training, and issues arising from long-duration missions in space. As the first chapter, we presented a profile interview with physician and retired NASA astronaut Story Musgrave. In the second chapter, we looked at NASA’s medical kits through the years. The third chapter was a peek at possible future medical devices for solar system exploration. This fourth and final chapter concludes with an overview of the main medical research conducted aboard the International Space Station (ISS) and with some examples of medical applications born in space and reinvented for Earth.